The Congress party has lashed out at the BJP government in Rajasthan for failing to protect cows despite having a "dedicated cow ministry". Recently, the carcasses of over a hundred cows were found on a plateau that spreads beyond Kochar village in eastern Rajasthan. The Indian Express reported that locals of the area abandon their old cows at this plateau - which is popularly called the region's "cow hill". 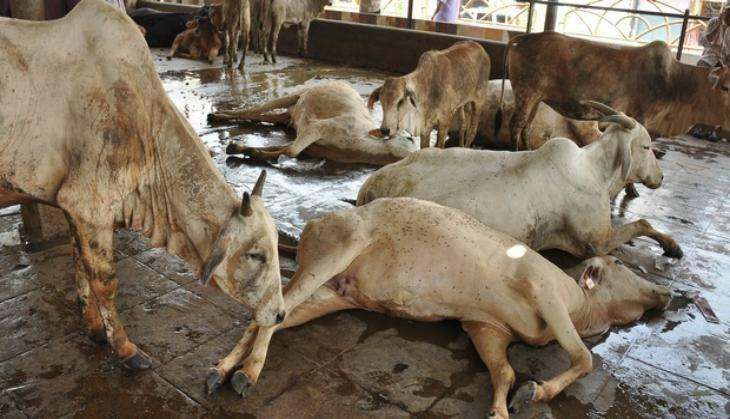 According to the report, this year, thousands of cows have to lay down their life out of starvation at the plateau - which is located at the confluence of three districts Karauli, Sawai Madhopur and Dausa. A large heap of cow carcasses was found hidden behind a stone wall on this land. "Cows, bulls and other govansh (cow progeny) are abandoned at this place every year. Some cattle die every year. But the deaths this year have been unprecedented," the Indian Express quoted Ramkesh Gurjar a resident of Khal-Satolai village as saying. "Those that haven't died, are waiting to die. They are starved, and weak and all that they have is dry fodder," Mahesh Chaparna, a local resident and employee of the New Delhi Municipal Council, told the Indian Express. The daily quoted Rajasthan Congress chief Sachin Pilot, who recently visited the land, as saying, "BJP uses the cow issue to stir emotions during polls. But its inaction in such a situation shows that it does not care for the helpless animals. This is the situation when the government boasts of having created the first ever Gopalan ministry in the country." Declining the allegations, Gopalan Minister Otaram Devasi claimed, "There has been a delay owing to miscommunication. But we have sanctioned Rs 1 crore, out of which Rs 60 lakh have been sent. We will release the remaining amount very soon".